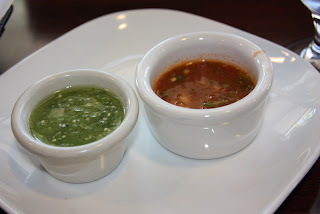 Salsa and chips - my favorite starter! Great food, nice setting. Loved the chips and salsa (esp. the salsa verde) and the entrees. 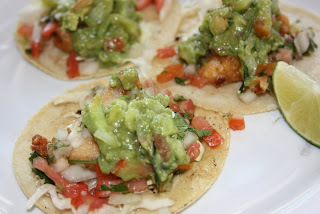 We ordered the trio of fish tacos which had great flavor and a decent amount of "punch" (spice). In addition (not shown) we finished off a plate of chile rellenos which were perfect: enough cheese to round out the heat of the chile. Overall - a very pleasant meal and a place I will be adding to my "go-to" places.